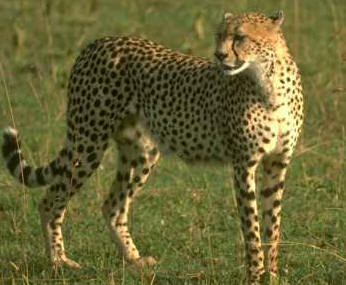 The Cheetah (Acinonyx jubatus) is one of the three larger cats in Africa, but is the only one in its genus. Cheetahs are speed hunters and catch their prey more often than not. But in being the fastest animals on earth they forfeit the strength to protect their cubs and keep their food. Lions and other predators frequently steel their food and kill their offspring. Cheetahs generally hunt alone but males sometimes form coalitions with other males. Female live alone with the cubs. They eat Thomson's gazelles as a main food source. The claws on the feet protrude providing traction and the black lines under each eye help reduce the sun's glare. The Lion (Panthera leo) is known by everyone. King of the Jungle is one of his tiles though lions are not found in the jungle but on a savanna. They are one of the few cats that live in social groups. There are typically 1 to 4 adult males in the pride and any number of females as long as the food is abundant. 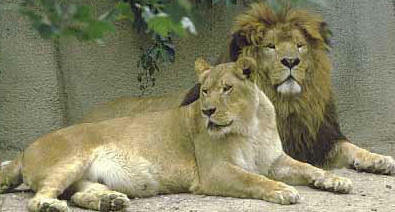 The females of the pride are always related. Lions hunt many species of ungulates from dangerous cape buffalos and zebras to small burrowing warthogs and fleet-footed gazelles. The Leopard (Panthera pardus) is a big cat with the largest distribution. It is found throughout Africa and much of Asia. Leopard are also the best big cats at climbing. To keep there food from the jaws of other predators the leopard drags it up a tree. Leopard are very secretive and are usually the hardest big cats to see in Africa. 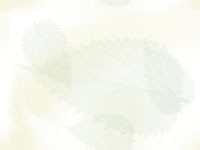 They are solitary and like to hunt in more denser foliage than the lion. From trees they can even jump onto the preys back. 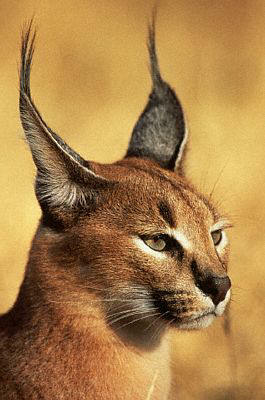 The Caracal (Caracal caracal) is an Asian resident as well as an African. They are sometimes called the desert lynx because of the likeness and yet they actually might be closer relatives than most. Caracals have an igneous hunting style that prevents them from being injured by prey. The stalk it but when apprehended they hit the prey over and over flinging it. Only when the prey is stunned dose the cat deliver the killing bite. In this way they kill birds, rodents, hyraxes and dik-dik. They will even attack larger prey like impala if the opportunity arrives. 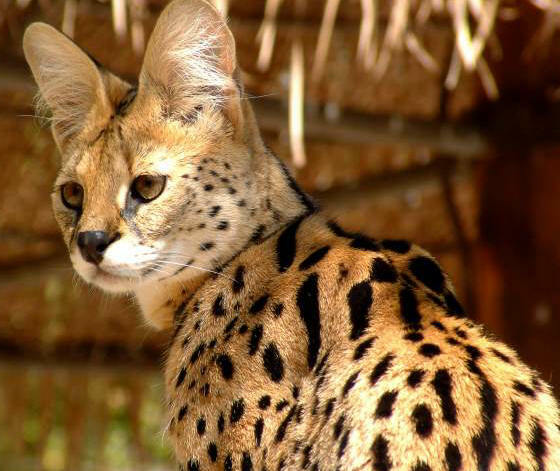 The Serval (Leptailurus serval) is shaped like no other feline. They have long legs and huge oval ears. Servals live in the grasslands, thorn shrub and savanna woodlands of Africa. Here the long canine -like legs come in handy letting the cat se over the grass and the large ears help to pinpoint a mouse in the thick grass. They also eat rabbits, guinea fowl, cane rats, mole rats, duikers, lizards, and fish. 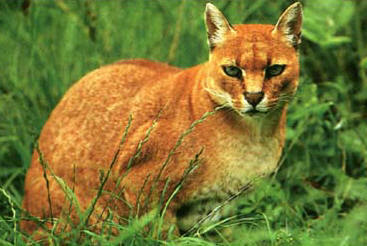 The African Golden Cat (Profelis aurata) lives in the tropical forest of western Africa and less dense areas. At twilight they hunt for rodent, monkeys, birds and hyraxes. They hunt on the ground but are skilled tree climbers. This cat lives with the threat of extinction due to the trade in its pelts and habitat destruction.